arc en rêve centre d’architecture presents a major exhibition devoted to the work of Chinese architects Wang Shu & Lu Wenyu from 31 May to 28 October in the Large Gallery. Wang Shu & Lu Wenyu, with their firm Amateur Architecture Studio in Hangzhou, have developed an approach that is radically different from most Chinese architecture. Freeing themselves from Chinese architectural traditionalism and often destructive modernity, they have established new practices that are both inventive and critical. 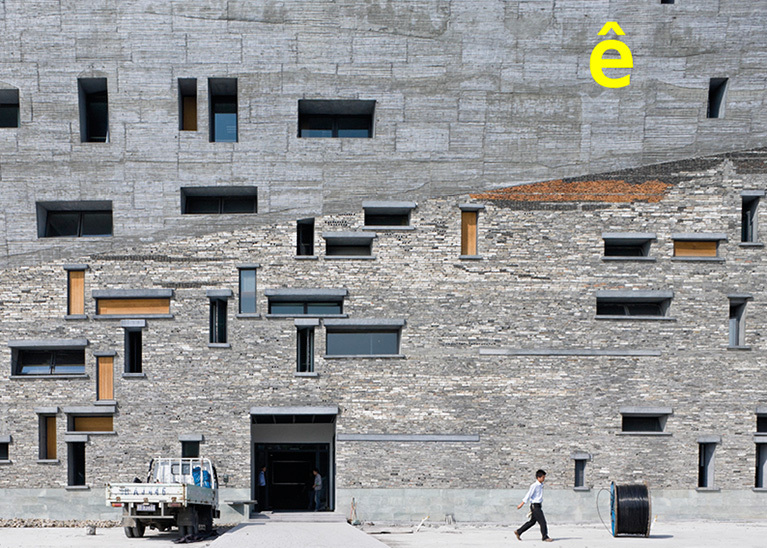 Their exceptional body of work and their commitment earned them the Pritzker Prize in 2012. Amateur Architecture Studio are builders who explore the relationship between changing architecture and lifestyles in China, poetically interpreting traditional Chinese expertise via contemporary architectural language. The name of the firm reflects their interest in vernacular Chinese architecture, which is craftsmanlike, affordable, spontaneous, and often impermanent. In a context of urban and rural change, architecture is all too often characterised by a lack of thought. The firm tackles the issue of the wholesale destruction and reconstruction of Chinese cities and thinks about ways of rebuilding in contemporary conditions that pay careful attention to both tradition and landscape. The work of Amateur Architecture Studio focuses on reinterpreting local traditional architecture and involves recycling and re-use. Repurposed materials, traditional crafts and ancestral building methods are all sources of inspiration. Over the last ten years, Amateur Architecture Studio has created a remarkable body of work and a unique style that challenges the role of the architect today, in China and beyond.